While President Obama’s executive action expanding deportation relief to almost half (48%) of the total unauthorized immigrant population will cover people from countries around the world, those born in Mexico will feel the most impact under existing and new guidelines, followed by Central Americans. The shares of unauthorized immigrants who will be eligible to participate in these programs are lower from the rest of Latin America, Asia and other regions of the world. More than half of unauthorized immigrants from Mexico (55%) and Central America (51%) will be eligible for deportation relief under the new or existing programs. Obama’s action was particularly relevant for Mexican-born unauthorized immigrants: While only 11% of Mexican unauthorized immigrants were previously eligible for deportation relief under the Deferred Action for Childhood Arrivals (DACA) program or through Temporary Protected Status (TPS), yesterday’s announcement will increase that share fivefold. By comparison, among the 51% of unauthorized immigrants born in Central America who will be now eligible for deportation relief, about half (26% of the total) had already been eligible under DACA or TPS. Overall, 44% of Mexican unauthorized immigrants will be newly eligible under the programs announced Thursday, compared with just 24% of unauthorized immigrants from other countries. About four-in-ten unauthorized immigrants who were born in the Caribbean (41%) or South America (37%) will be eligible for deportation relief this spring. This announcement will double the share of Caribbean unauthorized immigrants who are eligible for deportation relief (up from 21% under DACA and TPS), and triple the share among South Americans (up from 12%). Among unauthorized immigrants born outside Latin America, the total share that will be eligible is somewhat smaller. About a third of unauthorized immigrants from Asia (34%) and about three-in-ten from the rest of the world will be eligible. Still, prior to yesterday’s announcement, just 10% or less of unauthorized immigrants from these countries had been eligible. Under the prior DACA and TPS protections, Mexicans made up 44% of all the unauthorized immigrants eligible for deportation relief, while making up 52% of the total unauthorized immigrant population (no Mexicans are protected under TPS). The new executive action’s focus on length of residency and family status means that Mexicans will now be overrepresented in the share that is eligible for deportation relief, as Mexicans are more likely to have been here longer and to have families than most other unauthorized immigrant groups. Among those eligible for deportation relief in the spring, fully 67% are Mexican born, larger than their 52% share of the unauthorized immigrant population as a whole. By contrast, unauthorized immigrants born in Central American were overrepresented under the original DACA and TPS programs, making up 30% of unauthorized immigrants previously eligible for deportation relief, but just 15% of the total unauthorized immigrant population. Once the new eligibility programs are in place, they will make up just 11% of all those eligible. 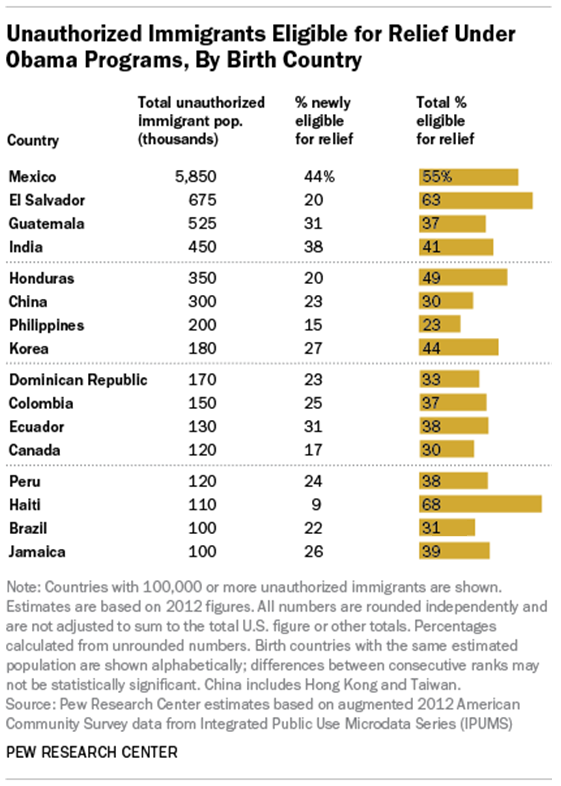 The countries of birth with the five largest U.S. unauthorized immigrant populations include three in Central America—El Salvador, Guatemala and Honduras. Within these countries, the total share that will be eligible and the effect of the new eligibility guidelines vary greatly. Among unauthorized immigrants from El Salvador, the share eligible will increase to 63% from the 43% eligible under DACA and TPS. For those born in Guatemala, the share will rise to 37% from just 6%. And among those born in Honduras, the share will rise to 49% from 28%. 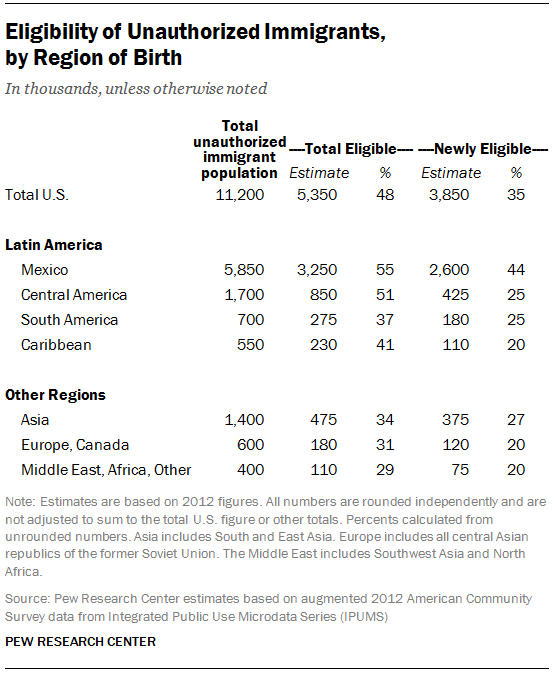 The accompanying table provides details about the share of unauthorized immigrants affected by yesterday’s announcement in birth countries with at least 100,000 unauthorized immigrants in the U.S. Correction: This posting has been updated with revised estimates for regions and countries, and with a new estimate of the share of unauthorized immigrants affected by the president’s program. Also, a previous version of this post referred to the president’s implementation of his new immigration policy as an executive order. He has taken executive action.